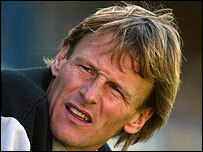 Veteran striker Teddy Sheringham has signed a one-year contract with West Ham on a free transfer. The 38-year-old former England forward was released by Portsmouth at the end of last season. Hammers boss Alan Pardew told the club's website: "I am very pleased to have signed Teddy. He will be a massive influence on the younger players. "His vast experience and goalscoring ability will be a vital ingredient to my promotion plans for this season." Joining West Ham provides Sheringham with a return to London, where he began his career with Millwall and spent two spells with Tottenham. He said: "I'm delighted to be here. I spoke with Alan Pardew last season when he was manager at Reading and was very impressed with him. "So when the chance came to join him at West Ham United I jumped at it. "I was a Hammers fan as a youngster and stood on the old North bank, watching the likes of Alan Devonshire, Ray Stewart, Billy Jennings and Graham Paddon. "So, to get the opportunity of playing for this great club is an honour and I'm sure I will enjoy the season helping the team to achieve their promotion goal." Pardew added. "Teddy is a proven goalscorer at all levels. "And strikers Marlon Harewood and Bobby Zamora who will benefit enormously from his presence."